The ruins of the gothic church in the centre of rebuilt Cologne are the most impressive symbol of the city’s almost complete destruction during the Second World War. In 1949 the chapel of “Madonna in the Ruins” was created within the church ruins by the architect Gottfried Böhm as a near improvised shelter for a gothic Mary figure that had remained unscathed. »Kolumba« is intended to be a place for reflection. The occasion is the new building for the Cologne Diocese Museum, which was established in 1853 and which features an extraordinary collection spanning from early Christianity to contemporary art. A museum as a garden continually bringing a few alternately selected works of art to bloom. The guiding thread of the collection is the quest for overarching order, measure, proportion and beauty which connects all creative work. This quest is the precious material for an aesthetic laboratory which studies the anthropological connections lying beyond mere chronology. Kolumba allows visitors to immerse themselves in the presence of their memories and offers them their own experiences on their way. As a „living museum“ Kolumba enquires about the freedom of the individual in an exchange between history and the present day, at the intersection of belief and knowledge, and defends existential values by challenging them through art. The new building designed by Peter Zumthor transfers the sum of the existing fragments into one complete building. 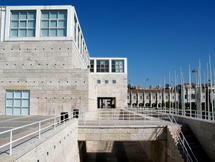 In adopting the original plans and building on the ruins, the new building becomes part of the architectural continuum. The warm grey brick of the massive building unite with the tuffs, basalt and bricks of the ruins. The new building develops seamlessly from the old remains whilst respecting it in every detail. In terms of urban planning, it restores the lost core of one of the once most beautiful parts of Cologne’s city centre. Inside the building a peaceful courtyard takes the place of a lost medieval cemetery. The largest room of the building encompasses the two thousand year structure of the city as an uncensored memory landscape. Its “filter walls” create air and light permeable membranes which contain within them the functionally independent chapel. The chapel is removed from the changing cityscape and given a final location, in which it will be assured a dignified continuing existence. Located above – carried by slim columns, which gently prod the archaeological excavation like needles – is an exhibition floor. Its spatial structure was similarly developed from the idiosyncratic ground plan. It connects seamlessly to the northern building part, which – as a completely new building – will house further exhibition rooms and the treasury as well as the stairway, foyer, museum entrance and the underground storage areas. The sixteen exhibition rooms possess the most varying qualities with regard to incoming daylight, size, proportion und pathways. What they all have in common is the reduced materiality of the brick, mortar, plaster and terrazzo in front of which will appear the works of art. Kolumba will be a shadow museum which will evolve only in the course of the day and the seasons. 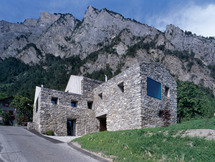 Some of the wall-sized windows allow daylight to penetrate from all directions. The steel frames decorate the brick coat like brooches and segment the monumental facade. Though respectful of the location and the seriousness of its contents, Kolumba will emanate serenity and an inviting cheerfulness.